You can create a deck with a continuous plank look throughout with the waterproof deck area only where you need it. The Versadry™ waterproof decking system is a two piece system consisting of the Versaplank™ and a special clip on extrusion (Dry Clip) that makes it waterproof. 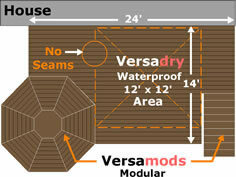 This unique design allows the installer to order the Versadry™ waterproof Dry Clip extrusion in individual lengths separate from the planks. For example; a 12' clip on waterproof Dry Clip channel can be combined with a 24' Versaplank™. The result would be a 24' aluminum plank that is half water proof. Example of a Versadeck deck design that combines all systems including the Dry Clip Channel confining the waterproof area to a specific location.